405 Marlborough is located on the north side of Marlborough, between Hereford and Massachusetts Avenue, with 403 Marlborough to the east and 407 Marlborough to the west. 405 Marlborough was designed by architect Samuel D. Kelley and built in 1889 by Keening & Strout Brothers, masons, for jeweler and real estate developer Edwin B. Horn, Jr., one of two six unit apartment buildings (405-407 Marlborough) built for Edwin Horn at the same time. 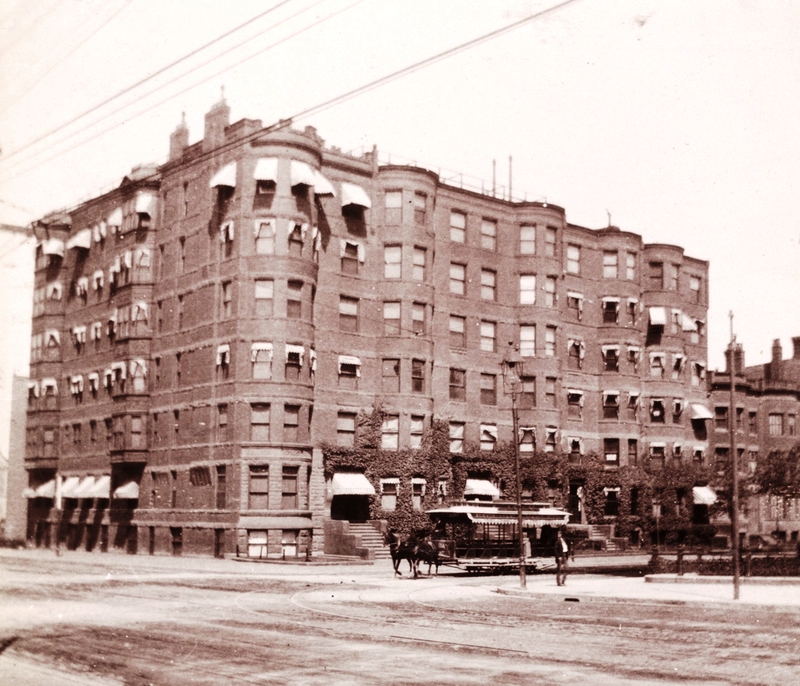 In 1890, he had two additional apartment buildings built, a twelve unit building at 409 Marlborough and a six unit building at 411 Marlborough, both also designed by Samuel D. Kelly and built by Keening & Strout Brothers. 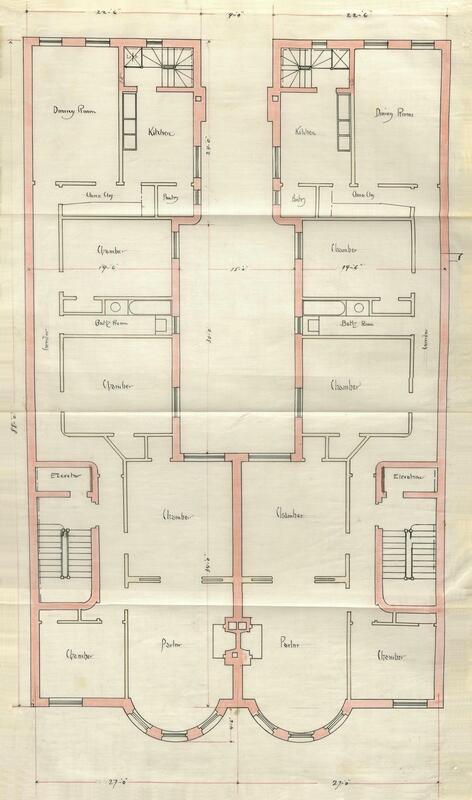 Edwin Horn is shown as the owner on the original building permit applications for 405 and 407 Marlborough, both dated January 24, 1889, on the final building inspection report for 405 Marlborough dated October 29, 1889, on the permit application for 409 Marlborough, dated May 19, 1890, and on the final building inspection reports for 409 and 411 Marlborough, both dated October 21, 1891. Edwin Horn purchased the land for 405-407 Marlborough on January 16, 1889, the lot for 405 Marlborough from Nelson S. Bartlett, and the lot for 407 Marlborough from Josiah Bradlee. 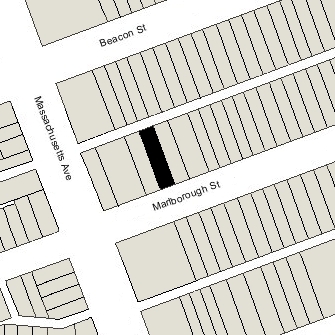 Nelson Bartlett had purchased the lot at 405 Marlborough on February 1, 1887, from Anna Sears Amory, the daughter of William Amory, Jr., and Ellen (Brewer) Amory. Josiah Bradlee had purchased the lot at 407 Marlborough on May 11, 1882, from Anna Sears Amory’s sister, Caroline Brewer (Amory) Lyman, the wife of George Hinckley Lyman, Jr. Both lots had been part of a 134 foot wide parcel purchased by Anna Amory’s and Caroline (Amory) Lyman’s father, William Amory, Jr., on February 10, 1881, from George P. Bangs and Charles P. Horton. All of the land had been part of a parcel purchased on March 1, 1872, from the Boston Water Power Company by a real estate investment trust formed by Grenville T. W. Braman, Henry D. Hyde, and Frank W. Andrews. Click here for an index to the deeds for 405 Marlborough, and click here for further information on the land on the north side of Marlborough between Hereford and Massachusetts Avenue. On October 1, 1889, 405 Marlborough was purchased from Edwin Horn by attorney Benjamin Lowell Merrill Tower. He and his wife, Eliza Curtis (Kneeland) Tower, lived in one of the apartments. They previously had lived at 133 West Concord. On August 7, 1893, Benjamin Tower transferred the property into his wife’s name. The Towers continued to live at 405 Marlborough during the 1895-1896 winter season, but moved thereafter to 432 Marlborough. By the next season, they had moved to an apartment at 409 Marlborough. On January 13, 1896, 405 Marlborough was purchased from Eliza Tower by Robert Waterston Lord, trustee under the will of his maternal grandfather Robert Waterston for the benefit of his mother, Marian Ruthvan (Waterston) Lord, widow of George Clement Lord. 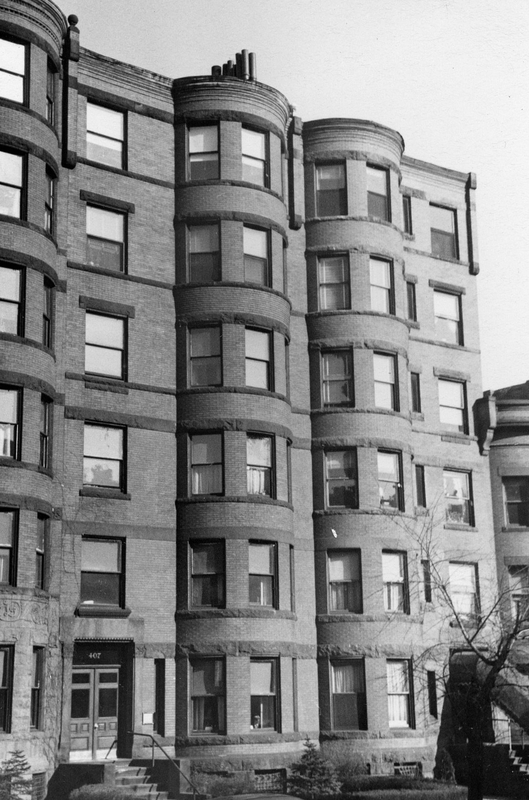 The January 14, 1896, Boston Globe report on the sale described the building as “one of the ‘swellest’ in this part of the Back Bay, and comprises a swell front brick apartment house of six units…”. Robert Lord and his wife, Ella Bowman (Greene) Lord, lived at 56 St. Stephen during the 1898-1899 winter season, but had moved to one of the apartments at 405 Marlborough by the 1899-1900 season. He was a ship and real estate broker. They continued to live there during the 1902-1903 winter season, but moved thereafter to 357 Marlborough. On December 2, 1902, 405 Marlborough was purchased from Robert Lord by Alonzo N. Burbank. 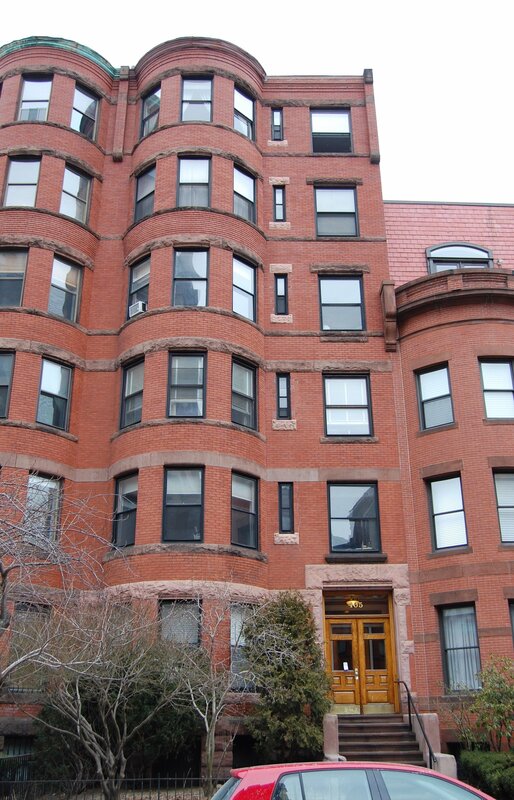 In May of 1902, he had acquired 407 Marlborough. He and his wife, Ann M. (Gale) Burbank, lived in Brookline and later in Newton. He was a founder of the International Paper Company and served as its treasurer and later as its president. On February 16, 1916, 405 and 407 Marlborough were acquired from Alonzo Burbank by Mrs. Sarah Elizabeth (Williams) Hodson, the former wife of Septimus Hodson. She was a secretary in the real estate offices of J. Sumner Draper and Mark Temple Dowling, and acted as conveyancer of the properties. The property changed hands and on November 23, 1916, was acquired by real estate dealer William N. Ambler. On April 12, 1920, Frederick A. Thayer foreclosed on a mortgage given by William Ambler and took possession of 405 Marlborough. The property changed hands and on November 1, 1922, was acquired by James Madison Todd, an investment banker. He and his wife, Ethel G. (Vivian) Todd, lived in Manchester, Massachusetts. They previously had lived in Cleveland, where he was a coal company executive. On October 26, 1931, 405 Marlborough was acquired from James Todd by Edward F. McKeon. On May 5, 1933, he transferred the property to the City Institution for Savings in Lowell, which held a mortgage on the property. In June of 1934, the bank filed for (and subsequently received) permission to increase the number of units from six to ten by subdividing the floor-through apartments on the third, fourth, fifth, and sixth floors. On February 1, 1937, 405 Marlbroough was acquired from the City Institution for Savings by Dryco Properties Inc. 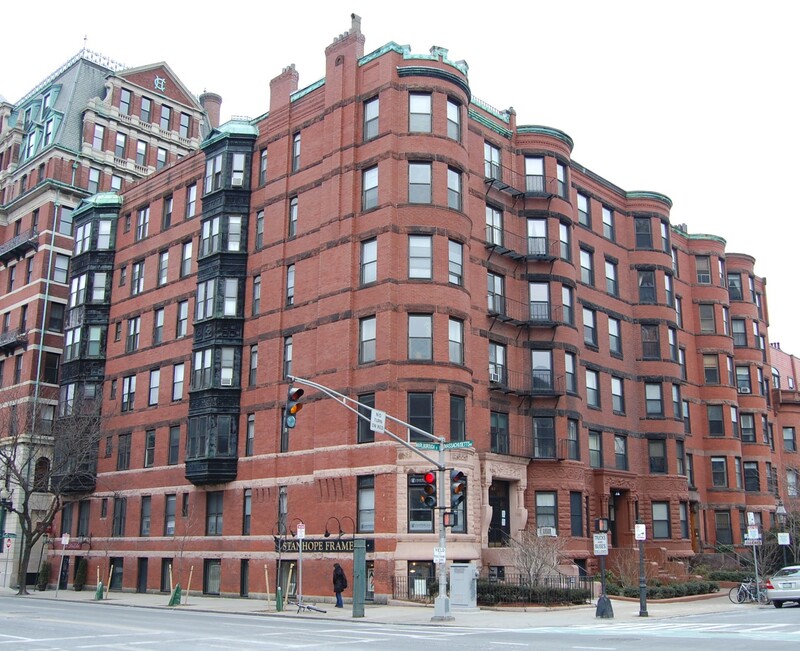 The property changed hands and on September 1, 1967, was acquired by John M. LeCoq, trustee of the 405 Marlborough Street Realty Trust. In April of 1968, the trust filed for (and subsequently received) permission to convert the property from ten apartments into eleven apartments and one office. On September 10, 1981, they converted the building into eleven condominium units, the 405 Marlborough Condominium.